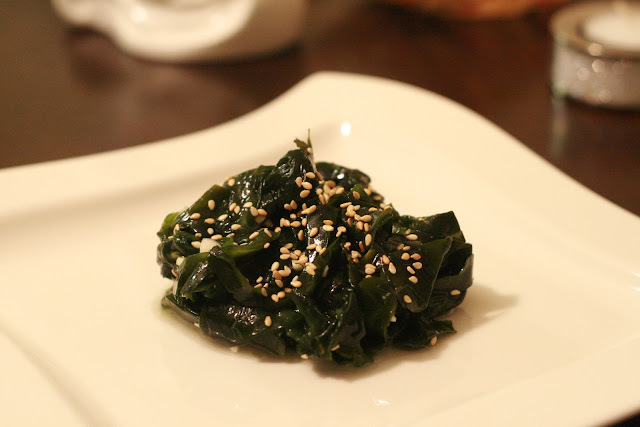 As of late I have been incredibly obsessed with the tiny dish of seaweed salad that is often served as a 'starter dish' in Korean restaurants. Also known as Miyeok Muchim in Korean, I find that I often ask for a refill (or two) of this dish. I love the salt and vinegar taste on the first bite, mixed with some sesame oil and a hint of sweetness that makes this dish taste so good! 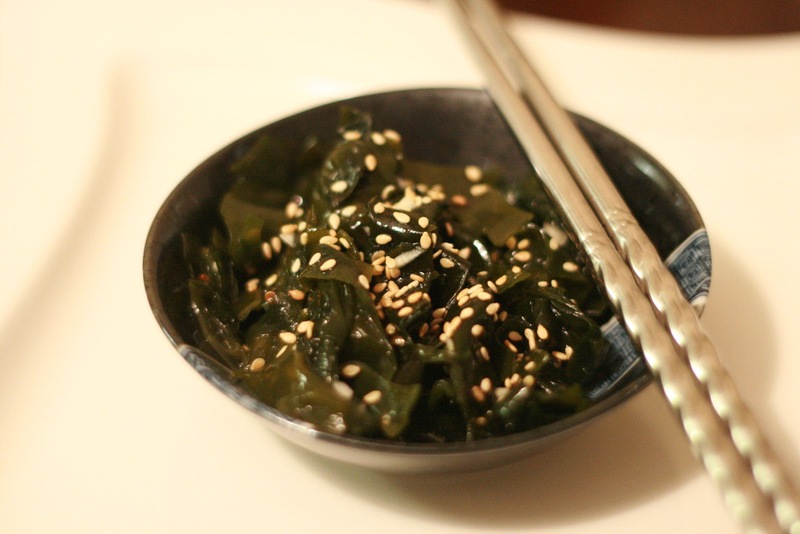 An added benefit to seaweed salad is that it is super healthy! If you eat it in moderation, you won't go too over on the calorie bank! So, in order to prevent myself from continually ordering refills of miyeok muchim in a Korean restaurant, I decided to make my own. 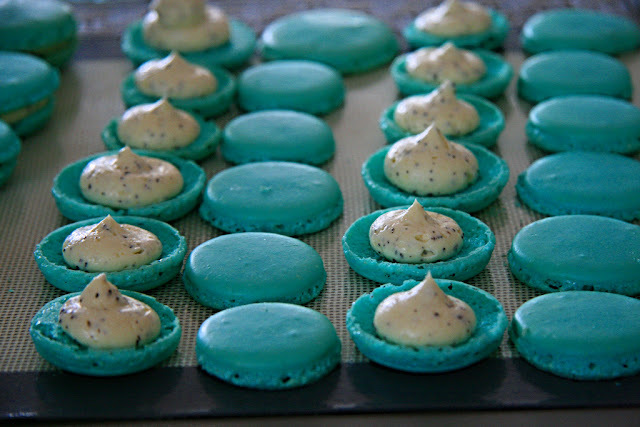 There aren't too many ingredients and you can adjust it to your taste. 1. Measure out 1 cup of dried seaweed. It looks like dried tea leaves at first! 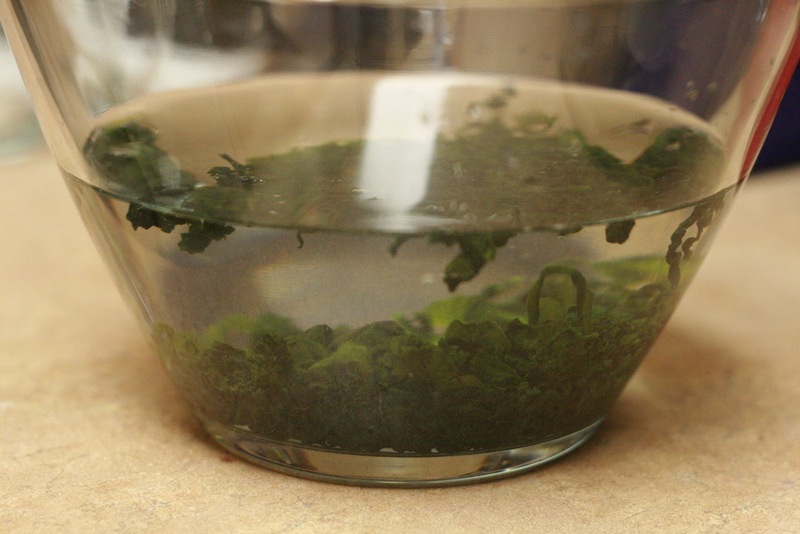 Soak the dried seaweed in a bowl of water for approximately 10 minutes. You will see the seaweed expand! 2. 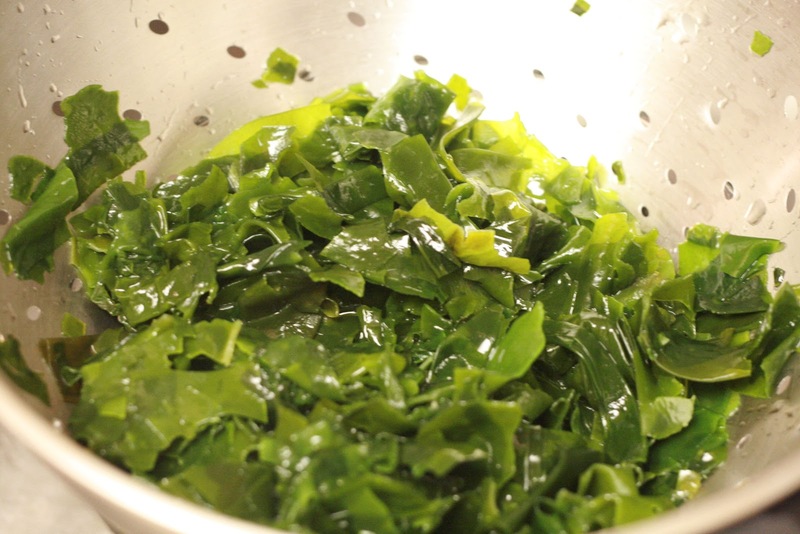 Rinse the expanded seaweed in warm water. Then in cold water to bring it back to a nice green colour. 3. Drain the water out of the seaweed by squeezing it gently. I also placed it into my salad spinner to get some more of the water out. 4. Place your seaweed in a large bowl. 5. 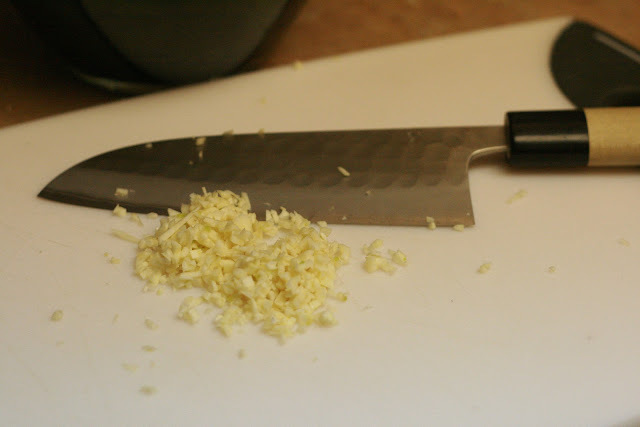 Finely chop 2-3 cloves of garlic. If you want your salad to be have intense garlic flavours (which is what I prefer) than chop up 3 cloves. Having a super sharp knife such as our recently purchased Yoshikane Santoku from Knifewear can make all the difference! 6. In a separate bowl put in your chopped garlic, then the sesame oil, rice vinegar, salt, and sugar. Mix well and taste. 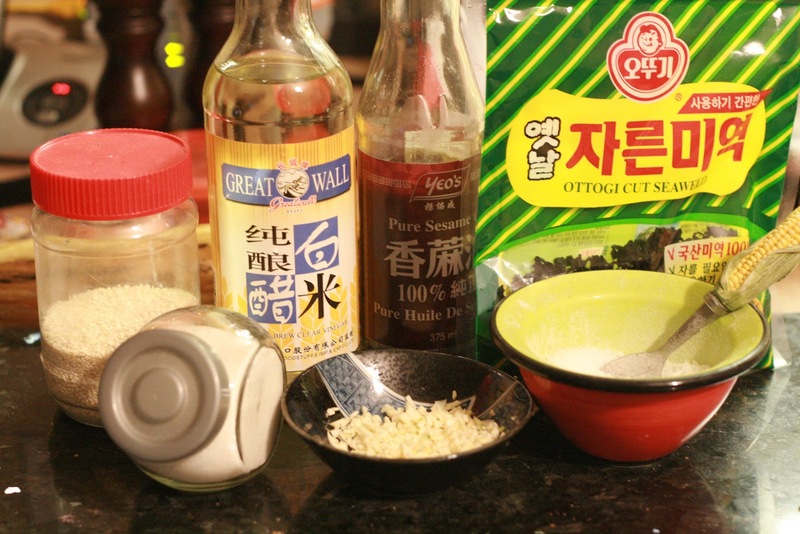 Adjust the flavours as needed; adding more rice vinegar or sesame oil to your tastes. 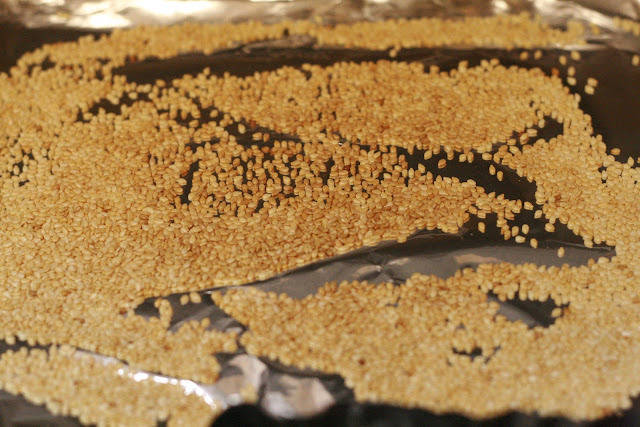 Sesame oil also helps to remove the briny or "fishy" taste that the seaweed sometime has. 7. Pour mixture over the seaweed. To get an even mixing, mix by hand. 8. The seaweed salad is best eaten or served cold. 9. Sprinkle some roasted white sesame seeds on top of the salad before serving.You can purchase white sesame already roasted or to make your own toast half a cup of white sesame in the toaster oven for a few minutes on low. Watch it careful as it can burn easily. 11. You can also add finely sliced cucumber, carrots, daikon, or even add a dash of red chili powder to make it spicy! You can purchase rice wine vinegar at any Chinese (T & T), Korean or Japanese store. To find the dried seaweed I went to a Korean store. There are a few Korean stores in Edmonton that I frequent. Two of them are in Millwoods- Korean Central Market at 9271 34 Ave NW and Korean Japanese Food and Wares at 3116 Parsons Road NW. 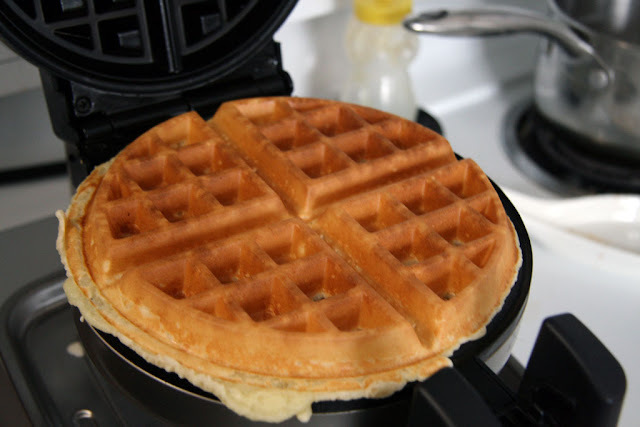 In the Donnan/Bonnie Doon area there is L & K Oriental Foods and Imports at 7743 85 St NW.